The United Irishmen, who were a Republican revolutionary group, are very interesting themselves, as they consisted of an alliance of Roman Catholics from all over Ireland, and Protestant Presbyterians (largely from the part of Ulster that is now within Northern Ireland), both equally committed to the cessation of British Rule on this island. However, the Presbyterians today, although their faith remains unchanged, are now largely committed to the continuation of a United Kingdom of Britain and Northern Ireland. Plus c’est la même chose…! I am reminded, by this, of the suggestion shared with me by one of my interviewees in Palestine – that there were Palestinian Jewish members of the PLO (Palestinian Liberation Organisation) who campaigned alongside Palestinian Arabs to create an independent state of Palestine. I don’t have the hard references to back this up, but I can well believe it, given that many Jews lived in Palestine long before the modern State of Israel was created in 1948 – no conflict is ever as clear-cut (Protestant v Catholic, Jew v Muslim) as the history books would have us believe. The Military Road also put me in mind of the Europa Hotel in Belfast, another example of that which remains the same but at the same time changes, and which deserves a blog post all to itself one of these days, such is my longstanding research interest in the building (it’s also the starting point of my walking tour, ‘Belfast: a City Shaped by Conflict’). The Europa opened its doors in 1971, just as the Troubles were kicking off in Northern Ireland. At the time that it opened, it was the very height of modernity in an otherwise quite provincial city. Initially intended as a positive investment that would spritz up the city, it is most famous nowadays for the dubious honour of being the most bombed hotel in Europe, or the world (depending on who you talk to) having been bombed over 30 times (they lost count) between 1971 and 1993 (Scoular 2003). Throughout the Troubles and the on-going peace process, the Europa’s building came to be, or mean, many different things to many different people – a symbolic target to the IRA (representing British investment money in the city), a sanctuary to the press, a ‘litmus test’ to the public (its boarded-up windows visible for miles after a bombing), the ‘maternity unit’ for the peace process, and now, having been extensively refurbished, as a swanky people-watching spot on the local night scene. Save for the modernisations, the hotel hasn’t really changed over its 40 year life – c’est la même chose – but no longer is it a target or a sanctuary, a litmus test or a ‘maternity unit’; it’s now one of many good quality hotels in a very much changed Belfast, and one that holds a special place in the hearts of the people here – plus en fait ça change. 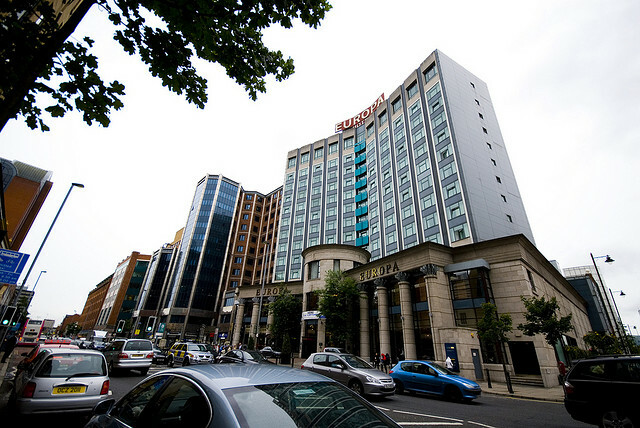 The Europa Hotel in Belfast, photo by me. The above photograph is by Philip Ray, accessed here. However I can’t help but feel that the origins and stories of these places, the Military Road and the Europa Hotel, linger in the experience of the present, even if it’s only on a subconscious level. As Andreas Huyssen put it, ‘The strong marks of present space merge in the imaginary with traces of the past, erasures, losses and heterotopias.’ (Huyssen, 2003) Isn’t there something poetic about a road built for control that’s now used for leisure, and a hotel that was a site of terror now being the place you take your guests to stay and your kids to abseil down for charity? Aren’t they in some way landmarks of resilience, perseverance and positive change? 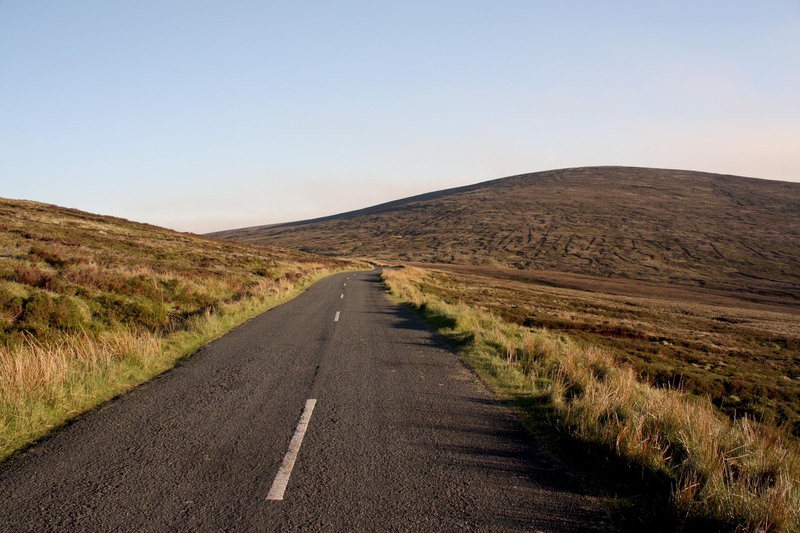 Scotland also has hundreds of miles of military roads built by the British Army which, having lain untouched and ignored for many years, have recently been rediscovered and newly appreciated, in some cases being listed and protected as historic monuments. I think this ability, in Scotland and in Ireland north and south, to see and acknowledge the traces of uncomfortable memories in the present reality, and to treasure them as positive assets today, is a sign of mature societies well on their way to becoming comfortable with their past and their present. Scoular C (2003) In the Headlines: The Story of the Europa Hotel. Belfast: Appletree Press. Old Roads of Scotland website article on Military Roads, accessed here. Barratt, S. Ireland for Visitors website article on The Old Military Road, accessed here.